The main rentsent dashboard allows you to quickly see which Owes need your immediate attention, what is coming up, and expenses that have already been dealt with. Get a quick look at "Who owes me? ", and "Who I owe?" to make sure nothing's out of place - use the "All Owes" view to look back at the details of Owes that have already been paid. Part of being responsible for group expenses is knowing who owes what. Splitting an expense and sending Owes becomes effortless with rentsent, which will keep track of who owes what, total it up for you, and send reminders if needed. Simple and flexible. Collect money from your roommates for rent, utilities, concert tickets, office pools or just track your own monthly bills. Take the difficulty out of being diligent. Every Owe can have a running stream of notes attached to it, where everyone with Owes can post comments, questions, itemized lists, confirmation numbers...etc. 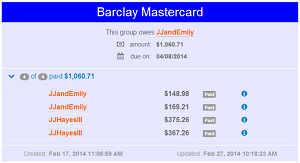 Notes help keep everyone apprised of what's going on with each Owe. 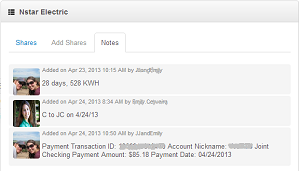 Reminders can be sent with the click of a button to anyone with an Owe to remind them how much is due and when. This is a simple way to make sure nothing is lost in communication, and problems can be sorted out before any money changes hands. PayPal is the most widely used only payment provider - connect your existing PayPal account to rentsent and get more features for your payments like scheduling and reminders! 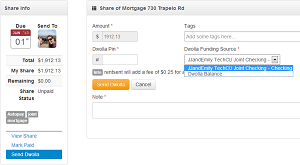 Dwolla is a cheap way to send money on the web - perfect for large sums like rent, where credit card fees are usually 3%! A bank account is all that's needed to use Dwolla for sending payments - and they usually clear quicker than a paper check.